PureBites are made with only 1 ingredient. 100% natural freeze dried US made cheddar cheese! Each tasty treat is high in protein, low in carbohydrates and is a great source of calcium! Dogs love the taste of PureBites because they are freeze dried which preserves the natural nutrition, freshness and taste of the cheddar cheese. 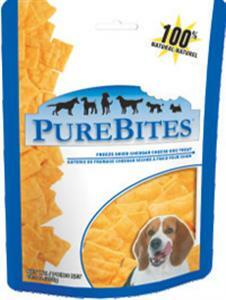 PureBites are a perfect choice as a special treat or as a training reward. Crude Protein 40% (Min), Crude Fat 25.0% (Min), Crude Fiber 1% (Max), Moisture 6.0% (Max). Dogs love them, but not the best as training treats. Crumbly in the pocket. Great as a natural wholesome treat and a training aid.I highly recommend this as well as their chicken and liver treats. This is one of my dogs' favorites. These are great treats for training, highly recommended! I got my order this morning and once I opened the bag, my dogs went beyond CRAZY for them. 100% REAL CHEESE, thats what im talkin' about!! My Great Dane has got attitude and is incredibly spoiled. He doesn't eat dog food at all. I cook for him every night, which gets pretty tiring at times. He does however like a few (very few) dog treats. I recently bought him the Pure Bites Cheddar Cheese, because he LOVES cheese. This dog treat is a big hit. My very spoiled boy LOVES LOVES LOVES this treat, A LOT! I recommend it highly to those picky eaters out there! These treats are high in protein and are a great source of calcium for your K9 friend! I would highly recommend giving your dogs Cheeder Cheese Purebites, THEY'LL LOVE IT!